While we may have all been enjoying the fireworks over the weekend, CBS wants us to enjoy the fireworks in the Big Brother 2014 house and we should see plenty of them tonight on Big Brother 16. We have seen plenty of action this weekend, but a ton of stuff went down after the live eviction show on Thursday night. You ready for some fun tonight on Big Brother 16? 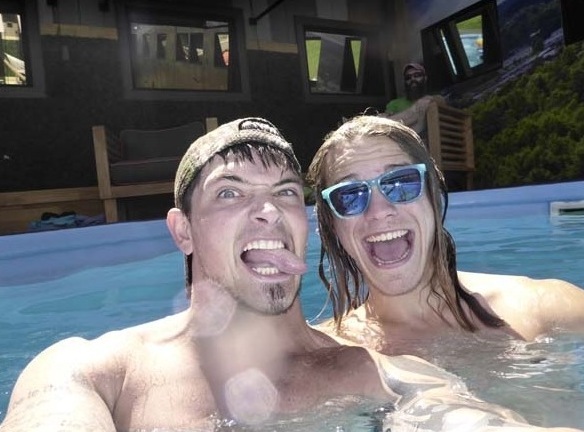 Check out our preview for Episode 6 below in our Big Brother 2014 spoilers! >>>Click here for our Live Recap of Big Brother 16 tonight!!! If you are one of those people that refuse to read any of our Big Brother 2014 spoilers and you only watch the shows on CBS then you have no idea what has happened since we saw Devin and Amber win HoHs on Big Brother 16 Thursday night! If you do keep up, then you know all the excitement that has happened since then and the drama and tears that are hopefully shown tonight! This is going to be a jam-packed night on CBS, as the HGs won’t even get any sleep before all the action takes place. We won’t even make it to the 4th of July and fireworks before these events happen. It is going to be annoying seeing Devin in charge and Amber do nothing, but we have to watch, right? Things are getting heated – or should i say MORE heated – as we speak. Devin is flip flopping on his noms like a fish out of water. He’s in over his head. I know things can turn on a dime in the house but with Devin all it takes is a penny. Wow. Keep us posted as you can! omg…Now christine is in the HOH room talking to Devin. She doesn’t seem terrified to me! I’m calling bullcrap on her feeling bullied statement. I think she is good at acting. What did she do? She just agreed with all he said. Then hugged him and left. Then she told Nicole in the bathroom what happened. LOL…I love her. She played him like a fiddle. That’s what she and Frankie were talking about last night. People who were stupid enough to be honest with Devin. Not just for the game but because Devin is so volatile. Frankie and Christine both admitted to each other last night that they are the only person each one tells everything. Yes and i believe it. But they are talking about going along with Devin because he is one of the people that will keep them safe. How does an emotional lunatic keep himself safe let alone you?! Ok. Add them to the dodo bird list…. LOL loved that one. He is a real card and they need to deal with him quick, and get him out of that house. I believe their thinking is that he would not vote them out because of the now proclaimed “5 member alliance”. Consisting of Devin, Amber, Caleb, Christine and Frankie. With Donny as a possible 6th. Ok stupid idiot list! Who willingly joins an alliance with those two?? Even assuming they weren’t unstable, or that most of the house hates them – who wants to spend that many weeks with them? Surely this is a temporary ruse…. Possibly. But think about it. Going to F2 with a hated hg is a smart thing to do. Not saying that Frankie and Christine will backstab each other but Frankie is turning on Zach. He’s trying to goad him into confronting Devin. Which will cause chaos in the house. And lead to Zachs eviction. We’re on fish. Wonder if Veto ceremony is happening now. It was on Sunday last week. Well I do admire gameplay but I would find a way not to make the next 10 weeks any more painful than necessary. Besides, you can’t trust or control Devin. That makes him a bad ally. Period. Duck Dynasty reruns are on. I need a break from all this Devinism. Show come Andy is on 24/7? Because BB thinks we want to see a winner….i mean wiener. Didn’t they call him the Rat? Yes we do call him the rat. Based on everything I’ve read online he is widely disliked. But bb is hoping we’ll forget. I will never forget. I love that one, never heard it before thanks ladies. Honestly I doubt Devin knows for sure what he’s gonna do until it’s done! I’d have to agree. He’s stewing alone in the HOH now. He even said “what am i going to do with the POV”. I have to admit that i’ve seen some pretty advanced cases of HOHitis. But he is the mother of all cases. everyone else walks off the set. I am starting to see wallflowers turning into vipers. Holy smokes! Did they medicate Caleb? The way he is talking now, I hope he wins. What a great guy from earlier scenes. Are you talking about him in the beehive with Amber and Brit? Not specifically, but in general with all I have seen since the “tiff” with Devin. Something big working in the background here. Amber working to be a BB lion tamer? It’s interesting, but this group seems to lack the drive we have been used to over the years. Too many young ones? Could be, but as more develops, more will be known. As a guy, I just love that cutie pie Nicole. I really like Hayden. Apparently he is very smart which I like and comes across as a good overall person. Just don’t like the hair. I like him too. 🙂 He has very beautiful insides.